I’d like to introduce you all to Daniel Pearce, The Dale’s Summer Student! Daniel is currently studying Film at Humber College. He is a lover of comedy: films, traditional stand-up and definitely Monty Python. Daniel enjoys all kinds of music, especially Punk Rock and Folk and is an avid reader, including poetry. Daniel recently turned 19. He calls Milton, Ontario home. I am excited that Daniel has agreed to guest blog here during his summer with The Dale. He is quickly becoming a part of the fabric of our community and will have, I’m sure, stories to tell. 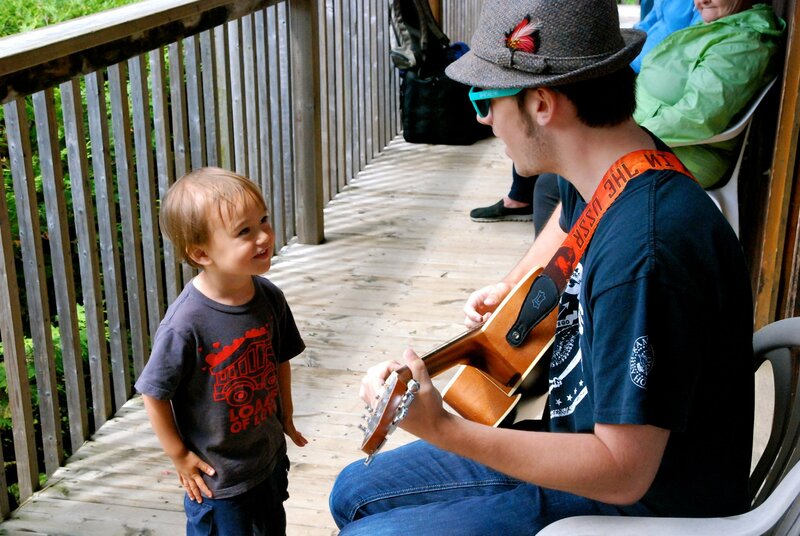 Daniel, serenading one of our youngest community members. A campsite full of energetic kids and mosquitos may not sound like a fun few days to most Torontonians, but The Dale’s three night retreat to Camp Koinonia ended with an entire bus full of folks who didn’t want to go back home. And if you look at all the activities that were crammed into just a few days up at camp, it’s not hard to understand why most people would rather live in their cabin the rest of summer. From campfire stories to canoe escapades, between archery lessons, jam sessions, and enough ping-pong to make it Canada’s national sport, saying Camp Koinonia was a good time would be an understatement. It is pretty close quarters in the Koinonia lodge, which is a very good thing, because just about everybody had a chance to interact with each other at some point. Every mealtime different people were sitting at different tables, but no matter who was sitting with whom, there was some good conversation going on. We had relatively good weather for our visit, save for a ton of rain on Tuesday. On the plus side, most people spent Tuesday together in the lodge, playing card games and catching up on World Cup soccer. It was so nice to watch people make the best out of a bad situation! A big part of the entire trip was music, as is usually a big part of the The Dale. There were various instruments brought to the Monday night campfire, such as an acoustic guitar, harmonica, and even a ukulele! Of course, there were also a ton of voices joining in for classic campfire songs. During the day, almost any point of the day, music could be heard from the lodge. Various people tried out playing a few songs on the keyboard and guitar, but the biggest musical highlight was a big group sing-along, with a full songbook and different people playing guitar, keys and percussion! Of course, the trip wouldn’t have even been possible without the Camp Koinonia staff, which was phenomenal the entire time we were there. Each meal was better than the last, culminating in a birthday cake served right before boarding the bus home! Staff was very friendly to all of us, and a few of them even joined some Parkdale musicians for a jam session, playing hits such as “House of the Rising Sun” and “Sweet Home Alabama”. When you live in a city like Toronto, constantly rushing through subway platforms full of sharpened elbows and breathing in air that would make a tailpipe cough, it’s a blessing to have a few days of peace and quiet in the great outdoors. Everyone I’ve talked to was grateful for the opportunity to get away from the big city, and we’re all looking forward to another great trip to Koinonia next year!